It's done! Sister's sweater is drying on the wooly board. It turned out larger than I wanted as my gauge changed part way through the bottom. Oh well - if she doesn't wnat it, I'll take it home to cold, winter Maine. I doubt she will pass it up as it will make a great outdoor VA winter sweater. Met up with friend Shirley and her DH today for lunch. She gifted me with a gorgeous pair of mittens and a bag of home made ginger snaps. 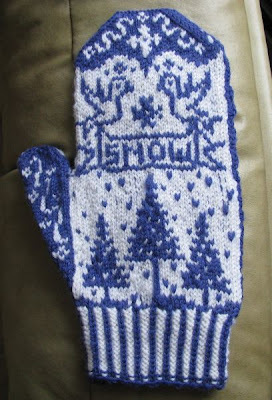 The mittens will be well used. The next project might be another stranded/fair isle sweater. I went stash shopping today and pulled every single of the 20 colors for Lismore, an Alice Starmore design from "The Celtic Collection". 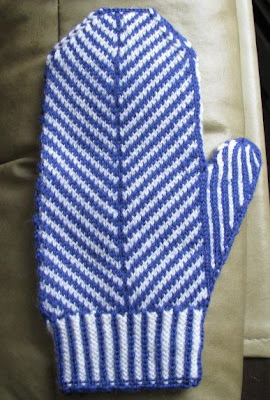 Here is a link to another knitter's photos in progress to see the basic colors - http://theraineysisters.com/?cat=19 . The original pattern called for Rowan yarns, long out of production. An internet friend who is a master AS fair isle knitter sent me her yarn conversion list to Jamieson & Smith jumper weight yarns. I changed out a couple but mostly liked what she had done. I'll leave them laid out for a few days to see if they grow on me or not as this will be a very long knit and I've got to really like it. it's wonderful! I'm sure your sister will treasure it. 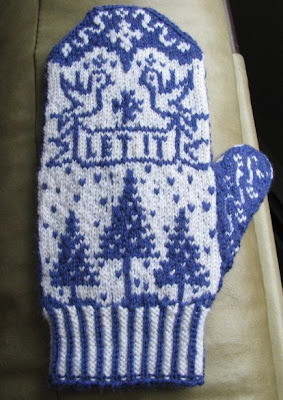 The mittens are cute, too. I'm holding off picking out another Starmore fair isle until the current Mara KAL is done in February. I'm itching to start one but MUST finish some of my WIP's. 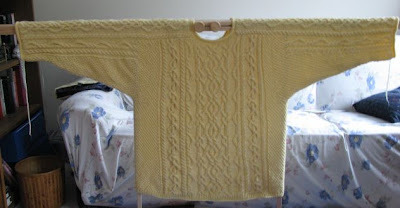 Beautiful sweater..you are one heck of a great knitter!! I wish I were on your "receive a sweater" list!!!! Cold up on this end of the state this morning..-9F with wind-chill. Your Fulmar is stunning! Lucky sister.